The Beware of Movies! series is meant to point out some of the scientific inaccuracies of popular movies, specifically in points related to the geological sciences. This post will point out the major inaccuracies portrayed in movies about climate change, and how it would affect the Earth. Commonly, about two seconds after I tell someone I’m a vertebrate paleontologist, they ask me what I think of Jurassic Park. Then I laugh. It’s either that or they ask me if I carry a whip like Indiana Jones. Then I snarl something about how 1) Dr. Jones was an archaeologist and 2) Indiana was the dog! Misconceptions about paleontology: 1) Paleontologists only study dinosaurs. 2) Paleontologists study arrowheads and ancient pottery. This blog post will point out the major inaccuracies portrayed in movies about the Earth’s composition and its magnetic field. Today (January 15, 2013) I presented a Beware of Movies lecture at a local retirement community. The focus was on the Interior of the Earth, and was the topic of an earlier blog post. It was a wonderful experience. (I love doing those things!) In the process of preparing, then delivering, the presentation, I did realize that I left a few critical things out. Hence, a new blog post! Meteorites — What do they have to do with the Earth’s interior? One of the big problems that arises with bad geology movies is that they get the composition of the Earth all wrong. There aren’t amethysts in the mantle. Diamonds and rubies would not co-exist. We know that the mantle of the Earth is composed of mafic and ultra-mafic rocks (think back to Bowen’s Reaction Series). That means it’s mostly low-silica, high iron and magnesium rocks down there. Even deeper, we know that the core is composed mostly of iron and nickel. As we stand on the Earth’s surface, such minerals and rocks are rare. It’s easy to think that most of the rocks of the Earth should be felsic things like granite, with tons of quartz. This is simply not the case. But why? How can we make the assumption that the mantle is mafic and the core is iron and nickel. We know some of this because there are a few places on Earth where mantle rocks have been exposed at the surface (usually due to tectonic events). We can hypothesize some compositions based upon how seismic waves refract through the body of the Earth (seismic waves travel at different rates through different materials). We can make some assumptions about the overall composition of the Earth based upon studies of meteorites. We assume that the bits of rock and dust that collected all those billions of years ago to form our beloved planet formed from the same bits of rock and dust that make up meteorites. If you take a meteorite and grind it up, you find it to be of mafic composition, with low silica, and high concentrations of iron, magnesium, and nickel. Some meteorites are almost pure nickel and iron. Others are more rocky. This is assumed to be the starting point for the Earth’s composition. Over millions of years, these mafic pebbles that came together to form the planet fused, and then underwent a process called ‘differentiation,’ which is just a fancy way to say ‘the heavy stuff went to the middle.’ Thus, the nickel and iron are at the core of the Earth, surrounded by the mantle of mafic rocks. Felsic rocks, like granite, tend to be light and naturally ‘float’ to the surface, which is why they are what we usually see in the rocks around us! Magnetism — The Earth isn’t exactly a giant bar magnet, but it’s similar. Here’s the neat thing about the core. It’s iron and nickel. Iron is a conductor. If you have an electrical current, you have a magnetic field. And voila! The Earth has a magnetic field. The core is divided into two parts, the liquid outer and the solid inner. The mantle is also solid. Because the Earth rotates, flow is set up in the Earth’s liquid outer core. With that flow, and a little nudge, an electric current is set up. The flow is thought to be in several isolated cylinders surrounding the solid inner core. This is where the ‘bar magnet’ analogy fails, because each cylinder has it’s own field, and these combine to form the magnetic field of the Earth. This is referred to the geomagnetic dynamo. Geomagnetic dynamo. All this is happening in the core. Because of the dynamic nature of flow in the core, the magnetic pole never quite lines up the the Earth’s rotational axis. In fact, the magnetic poles move around quite a bit, sometimes even reversing themselves (though this takes more than a single human’s lifetime). There are lots of questions regarding how the magnetic field forms and how it might reverse itself, and is an active field of research in geophysics. Beware of movies! The basis of the entire movie “The Core” is that the flow in the liquid outer core has stopped, thus causing the Earth’s magnetic field to fail. If we did lose the magnetic field, there could be repercussions, however, the magnetic field on Earth has gone essentially to zero multiple times in Earth’s history. Every time the magnetic poles reverse themselves, the field goes to zero first. While there is some evidence that this might have caused problems for certain single-celled organisms, large animals have not been affected. The cataclysms that are shown in the movie would not be expected. So don’t worry. This post will present some basic information about geologic time, how we know how old things are, and how movies often get these things wrong. How do we know the order in which geologic events happened? And how do we know exactly when they occurred? Uniformitarianism. This is an important concept used throughout the geological sciences. The short definition is “the present is the key to the past,” meaning that the processes that we observe on the modern Earth are identical to processes that occurred in the Earth’s past. Mountains exist today because of the motions of tectonic plates, thus ancient mountains also formed due to the interactions of plates. There are two basic ways of assigning ages (or dating) in the geological sciences: Relative and Absolute (or Numerical). Relative dating is used to place geological events in order of which came first, second, third, etc. Relative dating does not assign any ages (like ten thousand years ago) to events. We’ll begin with relative dating, as this is the basis upon which our geologic time scale was originally developed. Principle of Superposition – When looking at a pile of rocks, the oldest rocks are on the bottom. Because rocks don’t just float in space with big gaps below them. Principle of Original Horizontality – When sediments are deposited, they are deposited in horizontal layers. They’re flat. Thus, if we see rocks that are tilted in any way, we can assume that they were tilted after they were deposited. Principle of Original Continuity – Rock layers are deposited over wide areas, not just in the one place where we see them exposed. We assume that a rock layer in one area is continuous with similar rock layers in other areas, even if we don’t see the direct connection. This is one of the most important principles needed to understand the development of the geological time scale. Principle of Cross-Cutting Relationships – If there is a fault in a rock, or an obvious erosional surface, then we assume that these features occurred after the rock was deposited. That makes sense, because you can’t fault or erode something that does not yet exist! Principle of Inclusions – If there are two rock types (rocks A and B) next to each other, and one (rock A) contains pieces of the other (rock B), then the rock containing inclusions of the other rock must be younger. Rock A is younger than rock B in this example. Principle of Baked or Chilled Contacts – When magma comes into contact with pre-existing rock, reactions happen. The pre-existing rock is much cooler than the magma, causing the magma to cool rapidly and crystallize (making a chilled contact). At the same time the heat of the magma heats up and bakes the pre-existing rock, resulting in a baked contact. A baked rock is older than the igneous rock in contact with it. A chilled rock is younger than the rock it sits against. Using these principles we can place geological events in relative order. We can trace rocks from one area to another and compile all the rocks in an area, and even on a continent into relative order. It is based upon this that the geologic time scale was developed. The divisions of the geologic time scale (like the Jurassic Period) get their names from the area in which rocks of that age were first described (like the Jura Mountains). Some divisions are also named based upon the types of rocks that characterize that division. The Cretaceous Period gets its name because many of the rocks are composed of chalk. The Latin word for chalk is “creta.” Using relative dating methods much of the Earth’s rocks deposited over the last 600 million years have been put in order. We can then add to this fossils with which we can determine a fossil succession using the principles above. It is from this that much about the evolution of life on Earth is understood. Biostratigraphy is the use of fossils found in a rock to assign a relative or absolute age to that rock. Biostratigraphic units do not depend upon rock type and are thus defined according to the presence of a particular organism (an index fossil) or a complete fossil assemblage. Biostratigraphy is often used to correlate rocks of similar age but different rock types. It is through principles of relative dating and biostratigraphy that we know that dinosaurs and humans have never co-existed. Absolute (Numerical) dating is a means by which we can assign an number age to a rock or a fossil (or a geologic event). The method that most people have heard of is radiometric dating. To understand this, we have to talk a little about chemistry. The chemical elements come in many forms. Some are stable and some are unstable. The unstable ones are also called radioactive. Some elements can come in multiple forms, some stable and some radioactive. The difference is in how many neutrons are in the nucleus, or what isotope the element is in. Carbon, for example, has three isotopes: Carbon-12, carbon-13, and carbon-14. Carbon-12 and carbon-13 are stable. Most of the carbon in the universe is carbon-12. There’s a little carbon-13, and even less carbon-14. Carbon-14 is radioactive, however. It doesn’t stay around forever. At some point it decays (or self-destructs), which is why radioactive elements are so dangerous. Carbon-14 breaks down into Nitrogen-14, an electron, and an electron antineutrino, which sounds pretty awful. (And it is, if it happens inside your body! Those little extra bits can cause damage, which can lead to cancer.) Other radioactive elements break down (decay) in similar ways. The original element (in this case, carbon-14) is called the ‘parent.’ What’s left behind (Nitrogen-14) is called the ‘daughter.’ The decay of the parent into the daughter products occurs over a specific period of time, called the half-life, which varies from parent material to parent material. For carbon-14, the half-life is 5,730 years. The half-life is how long it takes for half of the parent material to decay into the daughter product. Here’s an important thing about half-lives, however. This does not mean that after two half-lives, all the parent product is gone. With each half-life, half of the parent product decays. You never really get rid of all the parent material, though there does come a point where it is so small that it becomes impossible to measure. For all of these, there are caveats. Firstly, it is important that all the materials being dated actually originally contained the parent material and has not lost any of the daughter product. This can be a problem for potassium-argon dating, for example, because argon, as a gas, can escape. Radiocarbon dating is only good to about 40,000 years before present, before there is so little of the parent material left that it no longer can work. It is also important to realize that for all of these methods, time zero (or ‘now’) is actually not right now in 2013. It’s actually 1950, which is when the methods were first established. For most radiometric dating methods, this doesn’t matter a whole lot, but for radiocarbon, it can be problematic. Nothing younger than 1950 can be dated using radiometric carbon. Beware of movies: In the movie Time Cop, with Jean-Claude Van Damme, there’s this shipment of gold that gets transported from the past into the future. This gold is radiocarbon dated (so they say) which informs the time cop agency that it was stolen from the past. Two problems: 1) There’s no carbon in gold. What exactly did they date? 2) If the gold came forward in time, via time machine, it should seem brand new. It should not date to the past. Unless somehow, radioactive decay speeds up in the beaming forward process. Detrital Zircons: Most of the methods described above are best used to assign ages to igneous rocks. Only radiocarbon dating really works well for sedimentary rocks (but even then, is only useful back to about 40,000 years before present). Radiometric methods can be used to assign ages to sediments when applied to ‘detrital zircons.’ Zircon is a mineral that forms in igneous rocks as they cool and can be dated using the uranium-lead methods noted above. These zircons are very resistant to weathering and become part of sediments that form new sedimentary rocks. Zircons can be isolated from sedimentary rocks and dated, which gives the age of the igneous rock that they came out of. From this, we can determine where the sediments came from. We also know that the sedimentary rock cannot be older than the youngest zircon that’s in it. Thus, we can derive a maximum age for the sedimentary rock, which can be useful to know. Fission-track dating: When radioactive elements decay, they leave trails of damage (or tracks) in the matrix of a crystal. These little trails are obvious under the microscope and most often form from the decay of uranium-238. Counting these tracks can be used to assign an age to the mineral and thus the rock that they came from in ways similar to detrital zircon analysis. Thermoluminescence (TL) dating is used to determine how long a mineral (and the rock that it is in) has been exposed to sunlight. As the mineral is heated, to emits a weak light signal, which is proportional to how much sunlight it was exposed to and therefore how long it sat on the surface. This can tell us how old a material is (like an archaeological artifact) or how long a surface (like a river terrace) has existed. The use of cosmogenic nuclides for dating surfaces has also come to prominence of late. As it happens, cosmic radiation bombarding an exposed rock surface can cause the appearance of new elements that wouldn’t be there otherwise. A scientist can measure the amount of these so-called cosmogenic nuclides and assign an age to an exposed rock. This can be used to, for example, assign ages to the advances and retreats of glaciers. There are other methods used by scientists in assigning ages to rocks and fossils, or the parts thereof. For example, one could simply count rings! Dendrochronology is also known as tree-ring dating. Most trees have annual growth rings which can be used to count years from the initial growth of the tree to its death. If the tree is still alive, one can correlate events down to the exact calendar year. Dendrochronology can help us study paleoclimate and paleoecology, and has been used to calibrate radiocarbon ages. Sclerochronology refers to the study of growth lines in the hard tissues of animals and plants. Clams show growth lines, as do corals. Some teeth do as well. These growth lines aren’t necessarily annual and may be annual, monthly, fortnightly, tidal, daily, and smaller increments of time. Study of these can help us understand the biology of ancient and extinct organisms. Ice cores also have annual layers, due to yearly cycles of dust. It is possible to count the rings in ice cores that go hundreds of meters down and study ancient climate patterns, calibrated to precise years, using other geochemical methods. This is how we know much about global warming, glaciations, and climate changes. Beware of movies: Actually, this is something they got right in “The Day After Tomorrow.” Ice cores are commonly used to measure the concentrations of greenhouse gasses in the Earth’s past atmosphere. They use layer-counting to get the ages right. Some methods used for dating depend upon comparing patterns of change with similar patterns derived from rock sections of known age. Magnetostratigraphy is a technique used to date sedimentary and volcanic rocks. The Earth’s magnetic field has not always been such that the north end of the compass needle points toward the north pole. The field has reversed itself many times, and these reversals have not been regular. Scientists can go out and collect rock samples through a series of rocks and measure which way the magnetic poles were pointing at the time the rocks were deposited. This pattern is then compared with the ‘geomagnetic polarity time scale’ for the Earth (which has ages assigned to it). Where the patterns match gives an age for the rocks. Chemostratigraphy or correctly termed Chemical Stratigraphy is the study of the variation of chemistry within sedimentary sequences. Much like magnetostratigraphy, variations of particular chemical markers also provide useful time markers. For example, the Paleocene-Eocene boundary (~55 million years ago) is defined by a huge spike in the amount of carbon-12 in the Earth’s atmosphere, which is recorded in the rock. Chemostratigraphy can also be used to track environmental changes, since chemical markers change when climates and environments change. This post has covered most, but not all, of the potential methods by which geological units and events might be dated by geoscientists. If there are other methods that you’ve heard of, comment about them and I can explain those too. This post will present some basic information about volcanoes and how they work, and point out the major inaccuracies portrayed in movies about volcanoes. What is magma? How is that different from lava? It’s a good question. We’ve all heard the terms before, magma and lava, and probably you’ve got a general sense of what they mean, but do you know the specific definitions. Magma and lava are both words for molten rock. Liquid rock. Very hot. This distinction is that magma is below the surface of the Earth and lava is what you call it when it’s on (or above) the Earth’s surface. Molten rock is not all created equal. When you look at rocks, you realize that they’re of all different kinds. So if you melt that rock, it’s going to be of different compositions reflecting the rock that was melted. To discuss the composition (or types) of magma, we refer back to Bowen’s Reaction Series. Magma can be felsic (high silica, high calcium, aluminum, and potassium) or mafic (low silica, high iron and magnesium), or anything in between. These compositions affect the behavior of the molten rock. Silica tends to polymerize (make chains) in molten rock, which means that a more felsic magma tends to be more viscous (or that it doesn’t flow very well). The high levels of iron and magnesium in mafic magma makes it more dense. Also felsic rocks melt (to make a felsic magma) at much lower temperatures than mafic rocks. 1) The composition of the parent rock (the rock that melted to form the magma) – If you melt a mafic rock, you get a mafic magma. This is the most straightforward means to change or determine the composition of a magma. 2) Assilimation – If a magma body incorporates another rock, which then melts, unless the incorporated rock is of the exact same composition of the magma, the composition of the magma will change. As magma rises through the crust, it ‘eats’ through the rock above it (country rock), melting and incorporating the country rock, changing the composition of the magma body. 3) Magma mixing – Two separate magma bodies while moving together may wind up coming in contact and mixing. Unless the two magma bodies have the exact same composition, a new magma will result with a composition in between the original two magmas. 4) Partial melting of rock – As noted earlier, felsic rock melts at a lower temperature than mafic rock. When any rock melts, the first minerals to melt are the most felsic minerals. Over time, as the rock heats up, the more mafic minerals begin to melt. But a rock doesn’t always completely melt over time. If a rock only partially melts, and the melted rock (magma) moves away, the magma is more felsic than the original rock and the remaining rock is more mafic than the original rock. Thus, through partial melting, a magma may become more felsic. 5) Fractional crystallization – As a magma cools, the first minerals to crystallize are the most mafic ones, causing the remaining magma to become more felsic. These newly-formed mafic minerals might settle out, leaving behind a more felsic magma to continue on its way toward the Earth’s surface. Not all magma makes it to the surface. If it does, you get an eruption and a volcano. Lava erupts onto the surface to cool and form what we call extrusive igneous rocks. The magma that doesn’t make it to the surface will crystallize below the surface, and is called intrusive igneous rock, or just an intrusion. Since we’re talking about volcanoes, we’re going to talk only about extrusive igneous rocks formed from lava. What comes out of volcanoes? Lava is the molten rock that comes out of volcanoes, but there is much more that comes out. The opening out of which the lava flows is called a vent. But it isn’t always lava flows that come from vents. There is also ash and other pyroclastic debris. So what does that mean? The stuff that flies out of volcanoes is called volcaniclastics or pyroclastics. The root ‘clastic’ refers to little bits and pieces that get deposited together. The volcani- part refers to volcanoes (obviously), and pyro- refers to fire. So the words mean bits and pieces of rock coming from volcanoes or coming from fire. Ash – tiny glass shards that form when the lava crystallizes almost instantaneously. Beware of movies: It seems that in almost every movie (for example, Dante’s Peak and Volcano), there’s always a ton of ash snowing down upon the main characters of the story. This ash is glass shards! If you inhale this, it will cut your lungs to bits and you will die a miserable death. Yet, somehow, in movies this is never an issue. In paleontology, some of the best fossil assemblages came to be when an eruption occurred and the ash killed the animals in just this way. Then the ash buried the animals and perfectly preserved the animals for geoscientists to later discover. Lapilli – pea to plum sized fragments that can be streamlined from flying through the air. Blocks and bombs – apple to refrigerator sized fragments that are shot from a volcano. Blocks are bits of rock that were already cool when they were shot, whereas bombs were molten when they were shot and often are streamlined in flight. Ignimbrites (or pyroclastic flows) – avalanches composed of ash or ash plus lapilli. These things can go very fast, riding down the slope on a cushion of air, just like a snow avalanche. Lahars – a rapid slurry of volcaniclastic material in water (like a mudflow), most often caused when snow caps suddenly melt off of volcano peaks during an eruption. Beware of movies: In Dante’s Peak, there was ample opportunity for good pyroclasic flows and lahars, but there weren’t many. There should have been. And the ones that they did show were too slow and did not flow far enough. It was pretty weak, honestly. Different compositions of magma (lava) behave differently as they flow out of a volcano. Because of the polymerization of silica, felsic lavas tend to flow more slowly and in a more ‘chunky’ form than does mafic lava. Mafic flows can move much greater distances than can felsic flows. Eruptions of fast-moving, low-viscosity mafic lavas are often what we call ‘effusive,’ or characterized by huge flows and lava lakes. Other eruptions like that of Mount Saint Helens in May of 1980 (or of Dante’s Peak), are ‘explosive’, which characterizes eruptions of intermediate to felsic lava. Magma (and lava) often contains dissolved gasses, which must escape when the lava erupts. If the gas can escape easily, an eruption will be more effusive, but if the gas cannot escape, eruptions may be very explosive. The interaction of eruptions with water also effects whether and eruption will be explosive or effusive. If a volcano erupts under water (or lava flows into water), the results can be explosive. What kinds of volcanoes are there? The types of flows coming from a volcano (and therefore, the composition of the erupting lava) determines the shape of the volcano. Shield volcanoes are huge, flat (shield-shaped) volcanoes that result from dominantly mafic flows that are effusive in character. The Hawaiian Islands are all enormous shield volcanoes. Stratovolcanoes (also called composite volcanoes) are tall, pointed volcanoes, often associated with explosive eruptions and felsic to intermediate compositions of lava. Such volcanoes tend to be composed of repeated layers of flows and pyroclastic depositis. Mount Saint Helens and Mount Rainier are two prominent examples of stratovolcanoes. Where do we find volcanoes? Volcanoes tend to be in specific places throughout the world, not just stuck willy-nilly where ever they seem needed. For example, you don’t find volcanoes in the middle of continents. The positions of volcanoes on the Earth is almost entirely dictated by plate tectonics. Volcanoes arise do to the interactions of tectonic plates, and thus tend to be at or very near plate boundaries. Additionally, plate tectonics dictates what kind of volcano might be found where. To review, there are three important types of plate tectonic boundaries: divergent (spreading centers, or mid-ocean ridges), convergent (including subduction zones and collisions), and transform (where plates slide past each other). Volcanoes are not common along transform faults, and usually only on those that have a slight component of spreading across them. In those cases, some mafic eruptions might occur, but they tend to be very small. Beware of movies: In the movie Volcano, a volcano forms from the La Brea Tar Pits in the middle of Los Angeles, California. This is along a transform boundary, but not one that would be a candidate for a volcano. This transform boundary has a slight component of convergence, so if anything there should be mountain building, not volcanoes occuring. Spreading centers, being the place where new crustal material is being formed from eruptions linked right to the mantle, tend to have large, mafic volcanoes. There has been little opportunity for the magma that forms these volcanoes to undergo any of the processes that would make them more felsic. Convergent boundaries, especially subduction zones, usually have large stratovolcanoes associated with them. Much of the margin of the Pacific Ocean is characterized by stratovolcanoes and subduction zones, and is called the “Ring of Fire” because of it. The magma formed at subduction zones forms as the subducted plate melts. The magma slowly rises through the crust, changing its composition as it goes due to assimilation and fractional crystallization, so that when it erupts it is generally intermediate or felsic in composition. Beware of movies: in the movie Dante’s Peak, the subject volcano is a stratovolcano in the Cascades. This is perfectly reasonable, as the Cascade Mountains are the result of the subduction of the Juan de Fuca plate under the North American plate. The one mistake that is made in the film is that it depicts rapidly-flowing, presumably mafic flows coming from the volcano, which do not make sense given the type of volcano they’re dealing with. Not all volcanoes are associated with plate boundaries, however. There are a few exceptions that form due to what are called “hot spots,” or heated plumes of magma that (so far as we know at this time) form at the core-mantle boundary and get all the way to the Earth’s surface. These volcanoes can appear anywhere on the Earth’s surface, two good examples being the Hawaiian Islands and the Yellowstone hotspot. Because the Hawaiian hotspot is in the middle of oceanic crust, the eruptions tend to be mafic, resulting in shield volcanoes. The magma for the Yellowstone hotspot passes through continental crust, resulting in highly explosive, intermediate or felsic eruptions. I’ve already discussed at great length that earthquakes cannot be predicted. Is the same true for volcanic eruptions? Actually, the story isn’t as dismal for volcanoes. We do often get some manner of advanced warning of an impending eruption, though the warnings might be months or only hours ahead of an eruption, or they might be false alarms. The movement of magma below the Earth’s surface, toward vents for example, are detectable by seismometers. In fact, the direction in which the magma flows below the Earth’s surface is even measurable if an appropriate seismometer network is in place. Outgassings, and temperature and pH changes of water bodies can also provide evidence of a possible eruption, similar to what was seen in Dante’s Peak. And, since we tend to know where volcanoes should exist and we know how they are formed, we have some hints about what to look for if an eruption may be immanent. There’s hope for predicting volcanic eruptions. But to know exactly when or how intense an eruption might be, is elusive. This post will point out the major inaccuracies portrayed in movies about earthquakes, and the mistakes that are made regarding how the important theory of Plate Tectonics works. Let’s start with earthquakes. Earthquakes are shaking of the earth, typically due to motion along a fault. There are other things that can cause earthquakes, but we won’t worry about those here. Not yet, anyway. Most of us have a general sense of what a fault is. It’s a big crack in the Earth’s crust, across which motion (or slip) can occur. Americans usually think of the San Andreas Fault, which cuts California from the northwest to the southeast. There are tons of misconceptions about faults, some of which are carried into the movies and TV that we watch. Let’s first talk about how faults work, and then address these misconceptions. Faults are divided into to main types: Strike-slip and dip-slip. Strike slip faults are those where the rocks on each side of the fault slide past each other in a horizontal fashion, to the right or to the left. Dip-slip faults occur when one side of the fault moves up or down relative to the other. The San Andreas Fault is a strike-slip fault. The rock on the west side of the fault is moving northward with respect to the rock on the east side. If you stood on the Sierra Nevada mountains and looked to the West, across the fault, it would look like the west side was moving to the right. Hence, the San Andreas fault is a right-lateral strike-slip fault. Beware of Movies: In the TV movie “10.5” (and in other movies like the original “Superman”), it was portrayed as if activation of the San Andreas fault would cause California to sink into the ocean. In fact, lots of people still seem to think this. The truth is that more likely, western California would slide up the western edge of North America and collide with Alaska. But don’t worry. That would take millions of years! For a dip-slip fault, the motion of the hanging wall relative to the footwall is how we know what caused the fault to form. In faults where the hanging wall moved up with respect to the footwall, we know that compression caused the faulting. This is called a ‘reverse’ fault. If the hanging wall moves down with respect to the footwall, the faulting was caused by stretching, and the fault is called a ‘normal’ fault. A reverse fault. The cat is standing on the hanging wall. The dark band was once continuous across the fault. The hanging wall has moved up relative to the footwall. The Wasatch Fault, that runs through Salt Lake City, for example, is dip-slip. It is an example of a normal fault that formed as the continent of North America was stretched out on the west side. All of the mountains of the Basin and Range in the West are bounded by normal faults. A normal fault. The cat is standing on the footwall. The dark band was once continuous across the fault. The hanging wall has moved down relative to the footwall. Reverse faults are common in big mountain belts like the Rocky Mountains and the Appalachians. These mountains formed by tremendous forces of compression. There is a special category of reverse faults called ‘thrust’ faults. Thrust faults are very low angle (close to horizontal) and can slip for hundreds of kilometers. Thrust faults can stack on top of each other (called duplexing) and take up tremendous amounts of shortening of the Earth’s crust. A thrust fault, a special case of a reverse fault. The cat is standing on the hanging wall. The dark band was once continuous across the fault. The hanging wall has moved up relative to the footwall. When there is an earthquake along a fault, the whole fault doesn’t move at once. Parts of it move, while other parts remain stationary. A fault will remain stationary for a long time as stress builds up across it, then SNAP! It goes. Earthquakes have epicenters, which most people understand to be where the quake originated. More specifically, the epicenter is the spot on the surface of the land directly above the part of the fault that actually moved. There’s a similar term, hypocenter, which refers to the actual spot, deep under the surface, where the fault moved. To find the epicenter and hypocenter, a geoscientist looks at the seismic waves from the earthquake as recorded by at least three independent seismic stations. There are several types of waves generated by earthquakes, most importantly p- and s-waves. p-waves are “primary” waves, and arrive at seismic stations first. These are compressional waves. s-waves (“secondary waves”) arrive next. s-waves are shear waves, so they won’t pass through liquids. The separation in time between the s- and the p-waves tells the geoscientist how far away the earthquake happened, but not what direction. With several seismic stations, the actual point (the epicenter) of the earthquake can be found. Beware of movies: The movie “10.5” had all sorts of gems about epicenters, hypocenters and seismic waves. One quote was “the s-waves are off the chart!” which is interesting because it’s not the p- or the s-waves that are the big sweeping squiggles on a seismogram. The big squiggles are from the surface waves, which come much later. The characters also became excited as they looked at seismograms shouting about side-by-side motion. Honestly, I don’t even know what that is. The characters were delighted that the hypocenter was deeper than they could measure (“sub-asthenosphere” even), which is bizarre. Read on about that. Intensity of earthquakes is usually measured on the Richter scale, where greater numbers mean a bigger quake. The Richter scale is logarithmic, meaning that a magnitude 5 quake is 10 times as powerful as a magnitude 4 quake. It is measured in reference to how large the surface waves generated by the quake actually are. The first surface waves are usually the biggest, and then they taper off. The fault moves one time – suddenly – then stops. Aftershocks (renewed motion) might occur, but each of those come with their own seismic signature with p-waves, s-waves, and intensity. Beware of movies: Here’s the thing: Magnitude of a quake is calculated after the quake is over. In 10.5, they’re measuring (somehow) the intensity of a quake as it is happening. What’s more, the intensity of the quake (in the movie) increases over time. That does not happen with real earthquakes! WHY ARE THERE FAULTS AT ALL? Obviously, something has to be driving all this compression and stretching and shearing that causes faults to exist at all. The theory of Plate Tectonics provides the best explanation for the existence of faults and the forces that drive their motion. As mentioned in a prior Beware of Movies! post, the Earth’s surface (lithosphere – down to about 100 km depth) is broken into several plates, which move around. These plates can be divided into two categories depending upon their thickness and composition. Oceanic plates are under the oceans. They are much thinner but are made of very dense material. Continental plates are the continents, and are thicker but not all that dense (as rocks go). Some plates, like the North American plate, have parts that are continental (all of North America) and parts that are oceanic (the North American plate extends halfway across the Atlantic Ocean). Major tectonic plates of the world. There aren’t gaps between the plates, so something has to happen so that the plates can move. There are three general types of plate boundaries: convergent, divergent, and transform. Convergent boundaries exist where two plates are coming toward each other. Divergent boundaries occur where plates are moving apart. When plates slide past each other, we have transform boundaries. Three types of plate boundaries. Convergent boundaries involve compression, so it’s no surprise that faults associated with such boundaries are usually reverse faults. The nature of the boundary itself is dependent upon whether the convergence is between two continental plates, or if oceanic plates are involved. If two continental plates are converging, there will be a collision, just like when India hit Asia millions of years ago resulting in the Himalayas. The Appalachian Mountains of North America are remnants of an ancient collision between Africa and North America (which have since moved apart). An oceanic plate can sink under another plate, resulting in subduction, where one plate overrides another. A subduction zone is like a colossal reverse fault, though we don’t generally call it as such. Subduction also results in mountain ranges, like the Rocky Mountains and the Andes. Subduction is also associated with volcanoes. The volcanoes of the Cascades and of the Andes are related to subduction. When plates move apart, stretching and thinning of the plates occurs, along with lots of normal faults. The lithosphere gets so thin that magma comes up from the mantle (below the lithosphere) causing a line of volcanoes. When such stretching begins, especially in the middle of a continent, it is called ‘rifting.’ The East African Rift system is a prime example of this. Lake Victoria sits in the depression caused by the rifting. At some point the rift becomes so deep that it is filled with ocean water. New oceanic crust is formed by the volcanic eruptions. This is happening in the Red Sea today. As this continues, a whole new ocean forms. The entirety of the Atlantic Ocean was once just a little rift between North and South America and Europe and Africa. When plates slide past each other, we get transform faults. These are strike-slip faults. Sometimes there’s a bit of volcanism associated with these but usually the big activity there is earthquakes. The San Andreas Fault is a transform boundary between the Pacific plate and the North American plate. Beware of Movies: The movie “Volcano” is based on the premise that the plate boundary between the Pacific Plate and the North American plate could spawn a new volcano, similar to those in the Cascades. The problem is that there is no subduction along the San Andreas Fault. There is subduction below the Cascades, but it’s not the Pacific Plate that’s being subducted. It’s the small Juan de Fuca Plate. The Juan de Fuca plate is a remnant of a once much larger plate (the Farallon) that has been completely subducted under North America. Plate tectonics explains that most faults occur due to motions of the lithospheric plates, resulting in a limitation of where faults might be seen on the Earth’s surface. Faults also are limited to the lithosphere, or the upper 100 km or so of the Earth. The lithosphere – the crust especially – tends to deform in a brittle fashion. That is to say, if you put pressure on the rock, it will likely crack and snap. Below the lithosphere, heat and pressure are so high that rock (though it is still solid rock) deforms in a ductile or plastic fashion. It bends slowly or flows, due to individual motions of atoms. Big cracks and fissures do not exist below the lithosphere. Beware of movies: In the made-for-TV movie “10.5,” the geologist claims that the massive earthquakes are being caused by faults existing 700 km down. Not only is that below the lithosphere, it’s in the lower mantle! Faulting cannot exist at such a depth. The take-home message here is that earthquakes do not occur willy-nilly all over the surface of the Earth. They are most often associated with plate tectonic boundaries or mountains. There are a few that pop up in unexpected places. Some are even devastating, like the New Madrid earthquake that hit the mid-western United States in 1812. In that case, the earthquake resulted from the re-activation of an extremely ancient fault system that is no longer active, but had accumulated some stress over millions of years. I hasten to mention that the New Madrid fault is still in the crust! Beware of movies: We don’t know where every fault is. We can’t predict earthquakes. Don’t believe it when characters in movies (like “Earthquake” or “10.5”) claim to be able to do so. It can’t be done. Not yet, anyway. This blog post will point out the major inaccuracies portrayed in movies about the structure and composition of the Earth. One might think that we have no way to know what the interior of the Earth is like. The Earth is over 6000 kilometers in diameter, and we’re doing good to drill a few kilometers into the crust. Here’s the reality of the Earth’s structure. At first pass, the Earth is composed of the crust, the mantle, and the core. The mantle and the core are each divided into two parts, the upper and lower mantle, and the inner and outer core. The crust is the part that we live on. It is very, very thin compared to the rest of the Earth, going down only to about 7 to 70 km (depending on where you are). The base of the crust is marked by the Moho (which is short for the Mohorovičić discontinuity). Below that is the upper mantle down to a depth of about 660 km, followed by the lower mantle down to about 2900 km. It is a common misconception that the mantle, being very hot and under pressure, is molten. This is absolutely untrue. The mantle is solid rock, with one tiny exception in the upper mantle that we’ll get to in a moment. Below the mantle is the core. The outer core, from 2900 to 5155 km in depth, is the only part of the interior of the Earth that is fully molten. It is composed of molten iron and nickel. It is here where the Earth’s magnetic field is generated. 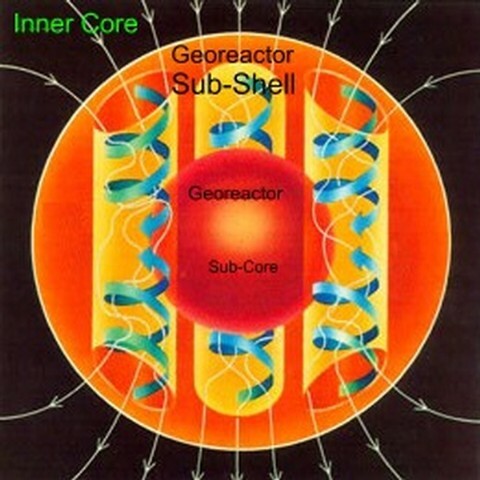 This is one of the few things that were correctly attributed in the movie “The Core.” From 5155 km to the true center of the Earth is the solid inner core, which is composed mostly of iron and nickel. This simplistic, three-part division (crust, mantle, core) is the extent of the description of the interior of the Earth provided by the movie, “The Core.” Equally, “Journey to the Center of the Earth” (2008) is no better. Both are over-simplifications. Before we move forward, it is probably worthwhile to explore how we can possibly know this much about the interior of our planet. As I already pointed out, we haven’t actually drilled completely through the crust. How can we possibly know the structure or the composition of the interior of the Earth. The movie “The Core” actually begins to show us how this is done. Solid rock can transmit seismic waves. Every time there is an earthquake somewhere on Earth, it sets off waves that pass completely through the Earth and can be recorded at seismic stations throughout the globe. Some waves pass through the Earth, others can only move along the surface. Seismic stations record both types and seismologists can determine when and where the earthquakes happened based upon when the waves are recorded. The way that waves pass through the Earth are affected by the types of rock. Some rocks speed up the waves, others slow them down. Waves bounce around inside the earth, too. So a seismic wave might bounce off of the core-mantle boundary. These properties, combined with multiple seismic stations, make it possible for us to know the composition of the Earth and the approximate position of any important boundaries within the Earth. Furthermore, one type of seismic wave, shear waves, won’t pass through liquids. So if a seismograph recording an earthquake shows no shear waves, we know that the seismic waves went through a liquid. This is how we know that the mantle is solid rock and that the outer core is molten. Beware of movies: In “The Core,” the terranauts find huge open cavities in the mantle. If such open spaces existed, they would have been evident from seismic studies. No seismic wave could pass through an empty space like that, and we would know about them. Similarly, in “Journey to the Center of the Earth” (2008), the main character discusses the existence of tubes that bypass the mantle and go straight to the core, which in the movie is hollow. Again, seismic waves would have shown such tubes and caverns. Since earthquakes occur all around the Earth all the time, one needs only to have a global set of seismic monitoring stations, and we can learn all about the Earth’s structure. Such a global network exists. Because of that, we know that the Earth is actually far more complex than just crust, mantle, and core. Many people are aware of the important concept in geology called “Plate Tectonics.” At a first pass, Plate Tectonics explains why it seems like South America and Africa would fit so well together, like puzzle pieces. That’s because they did once fit together and have since moved apart. The moving units on the Earth’s surface are called ‘plates.’ There’s a South American plate and an African plate. They were once together and have since moved apart. Individual plates are not just pieces of crust moving around on top of the mantle (a common misconception). The plates are pieces of the “lithosphere,” which includes the crust plus the uppermost part of the mantle down to about 100 km. Crust plus the uppermost mantle (called the lithospheric mantle) equals the lithosphere. The crust and lithospheric mantle move as one big piece called a plate. The structure of the Earth, including the lithosphere. Below the lithosphere, is the asthenosphere, which goes down to about 400 km in depth – basically much of the rest of the upper mantle. It’s in the asthenosphere that flow occurs. But wait! The mantle is solid rock! How can it flow? Two things happen: 1) Just like wax is a solid that can flow, so can the mantle. Individual atoms within the minerals of the mantle can move causing very, very slow flow. 2) Because of temperature and pressure gradients, between 100 and 200 km in depth there is the tiniest bit of melting. The whole rock doesn’t melt, just a few of the minerals. This slows down shear waves, but doesn’t stop them completely, which is how we know this slight melting exists. We call it the low velocity zone, because it slows down the shear waves. The various layers of the Earth have fairly specific compositions. The core is mostly nickel and iron, as previously mentioned. The rest of the Earth’s composition can be explained using Bowen’s reaction series. Read more about it here. The basic rocks of the universe are ultramafic rocks, so we would expect that the bulk of the Earth is composed of ultramafic rocks, which are primarily the mineral olivine. Ultramafic rocks are characterized by having high iron and magnesium and low silica. The crust of the Earth has some mafic rocks and minerals, but most are intermediate to felsic in composition, meaning that there’s high silica, potassium, aluminum, and sodium. These compositions are attained when the mafic rocks of the mantle are melted and erupted, then cycled through the rock cycle multiple times. Every time a rock is re-melted, the most mafic parts of it tend to be last to melt, and might not erupt, resulting in rocks that become more and more felsic over geologic time. Beware of movies: In “The Core,” the terranauts discover huge amethyst crystals in the upper mantle. Amethyst is a type of quartz, which is a felsic mineral. The mantle is ultramafic. What this means is that quartz would not be stable, it could not exist, in the mantle. This is a big mistake. Beware of movies: Both “The Core” and “Journey to the Center of the Earth” make the mistake of thinking that diamonds would be abundant in the mantle. The reality is that there are diamonds in the upper mantle, where conditions of temperature and pressure are suitable to form diamonds. And, “Journey to the Center of the Earth” never really specifies where they are in the mantle – probably fairly high, so maybe that’s ok (although there’s an additional problem with muscovite in that movie). In “The Core,” however, they discover huge diamonds presumably in the lower mantle, at least fairly close to the core-mantle boundary. Conditions aren’t suitable for diamonds low in the mantle, lack of carbon notwithstanding. The giant diamonds are bogus. This is the general understanding of the interior of the Earth, and how we know what we know. On this topic, movies are typically either pretty-darn-good or completely wrong. As always, extreme caution needs to be used when trying to apply the science of movies to real life. I’ve discovered that I left some things out of this post. Please visit this post to learn more about what meteorites and magnetism have to do with our understanding of the Earth’s interior. Beware of Movies! will be a series of blog posts discussing important concepts in geology while making reference to scientific errors in movies and TV regarding geological concepts. These posts go in concert with a lecture series I’m preparing with the same idea. It seemed fun. This is the first post in the Beware of Movies! series. A common misconception about geology is that it is a science ONLY about minerals and rocks. Well, and oil. But that’s it. Geology is a tiny bit more complex than that. However, it does include rocks (and minerals) as an important fundamental basis. A person can’t say much in any field of the earth sciences without first knowing quite a bit about minerals. Any compound that fits the above definition is a mineral. Ice (frozen water) is a mineral because it satisfies these criteria. Bismuth hopper crystals do not satisfy these criteria because they’re synthetics, so, while quite lovely, they do not constitute a mineral. When I start to talk about chemistry, my Introductory Geology students always groan. But I’m always able to assure them that what matters here is pretty basic and that it’ll be over soon. Chemistry matters because minerals have a specific chemical composition. This means that the individual atoms that go into a mineral are specified. The atoms are specific elements, like carbon and oxygen, and certain numbers of each of them combine (bond) to form the minerals. I will spare you the details of how the atoms bond. What’s important is that atoms have size. They’re like little spheres of differing sizes depending on the elements. When you try to stack the elements together, they stack in very specific ways. That is what causes the crystalline structure of minerals. Color – what color is it? Luster – how would we describe the shininess of the mineral? Metallic, earthy, glassy. Specific gravity – how dense is it? Crystal form – what shape are the crystals? Cleavage and fracture – how do the crystals break? Do they break along specific planes or along random surfaces? Hardness – is the mineral soft, like talcum powder, or hard like diamonds? Oxides – have oxygen (O) like Fe2O3, hematite (rust). Sulfides – have sulfur (S) like PbS, galena. Sulfates – have sulfate (SO4) like CaSO4 H2O, gypsum. Carbonates – have carbonate (CO3) like CaCO3, calcite (chalk). Native elements – gold, silver, carbon like diamonds! Beware of movies: In Armageddon (1998), our heroes are forced to drill into an asteroid to implant a nuclear device. Where they wind up setting down, so claim the characters, is composed of “iron ferrite.” That’s not any mineral I’ve heard of. It’s a redundant name, actually, because the ‘ferrite’ part, like ‘ferric’ or ‘ferrous,’ refers to iron. So iron ferrite is an iron-bearing iron rock. This is the most important group of minerals on Earth, in that they constitute most of the Earth. Therefore, oxygen and silicon are the most abundant elements on Earth. Life is carbon-based, but we’re just a think veneer on a very, very large sphere. But if silicon is so common, why are there not silicon-based life forms? Silicate minerals are categorized by how the silica tetrahedra relate to each other in the mineral. They can be isolated, or bonded to one another by sharing the one or all of the oxygens on the tips of the tetrahedra, to form chains, sheets, or complex networks. While this sounds like there’d be lots of silicate minerals, it turns out that there are relatively few that a person needs to know to be able to identify most minerals in ordinary rocks. We’ll get to that in a moment. A rock is an amalgamation of individual mineral grains. Often there are several minerals in a rock, like granite that contains quartz, biotite, and two types of feldspars. But a rock can be composed of grains of all one mineral. The best example of this is a nice clean sandstone which can be made of only quartz grains. Beware of movies: In Journey to the Center of the Earth (2008), Muscovite is called a “thin rock formation.” Muscovite is a mineral, not a rock. It does make nice thin sheets (because of its cleavage), but it’s not a rock. Bowen’s reaction series describes the stability of silicate minerals under different temperature regimes. Minerals at the top of the reaction series, form under conditions of extreme heat, but are not stable at the lower temperatures at the Earth’s surface. Minerals at the bottom of the series are more stable at low temperatures (like those on the Earth’s surface). Understanding Bowen’s reaction series will help anyone identify minerals in a rock. See, the minerals that go together in a rock aren’t just randomly selected. Certain minerals occur together. Some minerals are never found together in a rock. The minerals that can occur together are those that are stable at the same temperature ranges. So Olivine and Quartz will never occur in the same rock, for example. The minerals that are stable at high temperature are the mafic minerals, which are high in magnesium, iron,and calcium, and low in silica. The minerals that are stable at low temperatures (and are common on the Earth’s surface) are called felsic minerals, and are high in silica and hight in sodium, potassium, and aluminum. This doesn’t matter now, but will matter later when we think about volcanoes. Beware of Movies: The movie “The Core” seemed to struggle a bit with Bowen’s reaction series. The mantle of the Earth (the layer below the crust, where we’re living), is composed of ultramafic rocks. This means, high iron, high magnesium, and low silica. However, in the movie, the intrepid ‘terranauts’ find themselves in a large empty cavity in the upper mantle that is full of amethyst (quartz) crystals. Quartz is felsic. It would never be stable in the mantle. This is a massive mistake. All rocks on Earth can be divided into three groups (and some might fit into more than one). Igneous rocks: Those rocks that formed from the cooling of molten rock (magma). In these the crystals that make up the rock form according to Bowen’s reaction series (as well as the composition of the magma itself). Sedimentary rocks: Rocks that formed from the deposition of bits and pieces of other rocks that have been broken down and (probably) transported elsewhere. Alternatively, sedimentary rocks can form from the precipitation of crystals directly out of water, rather like hard water deposits. Metamorphic rocks: If pre-exisiting rocks of any kind are subjected to great heat and/or pressure, the minerals present, and their relationships to one another may change. This results in metamorphic rocks. Beware of movies: Bowen’s reaction series helps explain what silicate minerals might go together. There are similar limitations on what other minerals might occur together by what rock type they will be found in. In Journey to the Center of the Earth (2008), they find rubies, emeralds, and diamonds together in a lava tube. None of these would occur together. Emeralds are usually found in felsic igneous rocks. Rubies are found in metamorphic rocks, and diamonds form deep in the mantle, far away from either of the places where emeralds or rubies might form. Any of the three types of rock (igneous, metamorphic, or sedimentary) can be changed into any other type of rock in what is called the rock cycle. Existing rocks can be melted and cool again to make new igneous rocks. Existing rocks can be broken down, transported, and redeposited into sedimentary rocks. And any existing rock can be exposed to high heat and pressure to form a metamorphic rock. The end result is that there are very few tremendously old rocks on Earth, because most have been recycled. These are some of the basic concepts necessary to understand further topics in geology. Without this basis, it would be impossible to begin to interpret the Earth’s history from its rock record.